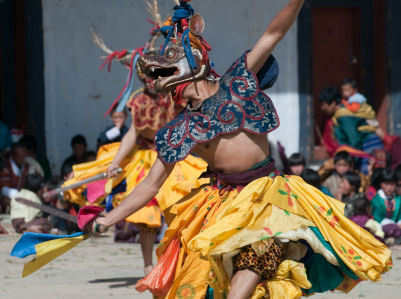 Bhutanese culture and Buddhist influence go hand-in-hand. The influence of religion is highly visible in every day life and is a major reason for Bhutan’s spiritual and cultural legacy. The hundreds of sacred monasteries, stupas, religious institutions, prayer flags and prayer wheels make Buddhism a faith that nowadays still is very alive and probably always will be in the kingdom. Not only this makes Bhutan a very authentic country; it is also because of the traditional woven garments the people wear, the typical robust yet refined architecture and the splendid cultural festivals which are steeped in Buddhism. All of these combined make Bhutan into a unique cultural setting. All religious ceremonies and rituals (and there are many!) are regularly performed, with reverence for all of life. All Bhutanese families go on a pilgrimage on auspicious days, offering prayers and butter lamps to the gods of the Himalayas. National and regional festivals coincide with the seasons, happening all year round. Bhutan might globally be a small country, yet it holds a very strong identity and unity. The rich cultural heritage is strongly promoted by its government. Although modernisation is slowly making its way, generating urban settlements and introducing computers, mobile phones and other Western modernities, most of Bhutans people still live quietly in small remote villages. The predominant way of life are small family farms and Bhutan’s number one occupation is being a farmer.